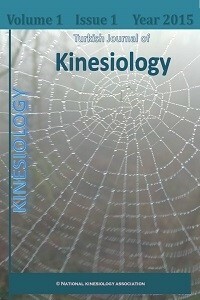 Turkish Journal of Kinesiology is an international, double-blind peer-reviewed, open-access journal. The journal publishes original research, reviews, and letters in all areas of kinesiology sciences. The journal primarily focuses on the topics: Sport and exercise physiology, biomechanics, sport and exercise psychology, motor behavior, perception and action, sport and exercise biochemistry and nutrition, coaching, physical education, public health promotion, traditional Turkish sports, sports injuries and rehabilitation, manual and physical therapy, and sports medicine. The journal is published 4 times a year. We encourage scientists from around the world to submit their papers to us. This journal aims to provide a platform for the researchers, academicians, and students to share knowledge in the form of high-quality research work in all the subjects and cover the fields of Kinesiology sciences.